applying eye makeup can sometimes be intimidating, especially when you are using new colors. 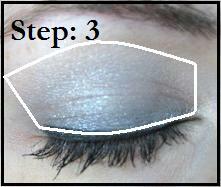 here is a quick and simple step by step tutorial showing what colors to use and where to apply them. 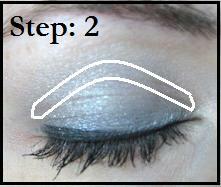 you too can apply makeup like a pro, it's as easy as 1-2-3.
finish with a shimmery shade to the entire eyelid. this blends all colors together and gives a nice smooth finish to the entire lid. this is what the finished product looks like. applying makeup doesn't have to be tedious, or take a long time. this easy shimmer shadow can be done in seconds. possibly a new look for a holiday party coming up? I always tell my readers...BLEND BLEND BLEND!! Love the tutorial Kris!! so happy to have bumped into your blog... very informative and love all the tips you are providing..
for sure following your blog now.. I invite you to check my blog out.... Hope you visit. Another reason why I like your blog so much! Is there a post that gives your top 10 products? for example, when you say "shimmery eye shadow" what kind do you prefer? I love it when you use examples of things so that I can compare that to what I already have or what i need to add to my shopping list. thx! Arielle, sorry for the delayed response but i am heading over to check it out ASAP. WinterBerry Glen, i have created a few posts listing my favorite things. but, for shimmery eyeshadow, Bare Minerals Queen Phyllis is my goto shimmer shadow. looks good with/over anything.